Posted March 1, 2016 by Monica Magnetti & filed under Brand Your Business, Business Tips, Industry Trends, SEO. The visuals of your website and blog are key elements to communicating who you are in business. Image SEO is the technology you need to know. As committed professionals, we invest a lot of time and money into establishing a virtual presence for our business. To maximize this initial cost, we have to maintain our website using specific protocols. I am writing a series of blogs for business owners on the fundamental principles for SEO ranking. 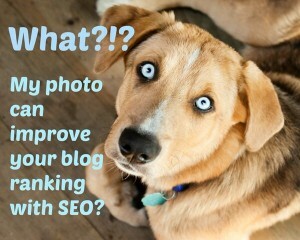 I also address how to write blogs that will bring you SEO results. 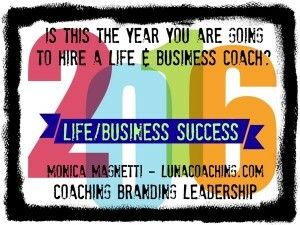 Posted February 11, 2016 by Monica Magnetti & filed under Achieve Goals, Brand Your Business, Business Success, Business Tips, Career Tips, Internet Branding Tips, Mindfulness, Personal Life and Business Life, Work Life Balance Tips. It doesn’t really matter if your life coach lives in Vancouver. Many business and life coaches like me provide excellent success by phone and online. The old idea that you have to work with a consultant in person to get results is passé. For over a decade now, business and life coaches have been achieving great results by phone and internet. Geography means nothing anymore. Choosing the right coach for you is the priority. Business success with a life coach? How is that possible? Well, it’s because many life coaches like me have doubled or tripled our certifications and now coach in many walks of life. Whether you’re self-employed or working for someone else, the responsibility for your business success rests with you! Your personal life and business life are no longer separate. They grow and develop together — or they don’t. It’s up to you. Posted January 25, 2016 by Monica Magnetti & filed under Business Tips, Industry Trends, Internet Branding Tips, SEO, Thrive in Life and in Business. 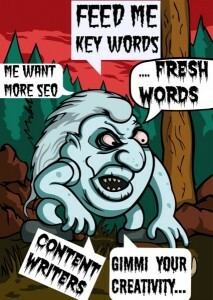 The web is hungry for fresh content written by poor soul like us content writers. The web has become an all-encompassing, self-fulfilling entity that keeps track of everything we do and influences the choices we make. Are we living the Orwellian truth? I spend a lot of time researching SEO tools and systems to better understand how to create functional yet personalized websites that rank well with SEO. Lately I’ve noticed that experts and articles in the field refer to the web as a mega entity with a mind and will of its own. “The web likes fresh content,” I recently read on a blog. “The web isn’t going to like that,” an optimization expert writes gloomily. I imagine the web as a humongous beast growing fatter and darker on the output of our imaginations and consuming fresh content written by poor souls like us content writers. Our creativity in eking out some kind of meaning in senseless keywords is the icing on one of the many cakes this beast devours, becoming more empowered with every bite. The web thrives on controlling us poor earthlings as we struggle to measure results and to please it. It laughs at the sweat and tears we shed in frustration while we evaluate ranking outcomes and find only randomness that cannot be squeezed into any formula. The smell of fear from the incandescent lava drooling from its gigantic mouth paralyzes every human who is affected by its importance. Well, now I’m just joking. Or am I? Having recently picked up, once again, George Orwell’s dystopian novel 1984, I’ve noticed how its ominous shadow has descended upon our modern world, with government surveillance and public manipulation by political entities. In 2015, this sounds like a description of the web. PS No keywords were abused in the making of this blog. Posted November 5, 2015 by Monica Magnetti & filed under Achieve Goals, Business Success, Business Tips, Legacy Entrepreneurs, SEO, Strategic Planning Tips, Thrive in Life and in Business, Trust Yourself. 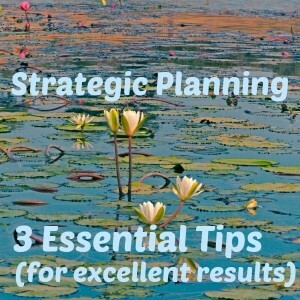 Strategic planning is for everyone with a budget. The only way to have a successful business and stay within the margins of your budget is to plan everything strategically before you launch. Posted September 17, 2015 by Monica Magnetti & filed under Achieve Goals, Brand Your Business, Business Success, Business Tips, Internet Branding Tips, SEO, Strategic Planning Tips. Would you want to step into a clothing store that had the same window display as last year? I doubt it. The same goes for the website. To keep visitors coming back, it’s important to keep updating your website. That’s how visitors will stay interested in what you have to offer.